Shamans practise a form of animistic religion (animism – magic thinking belief – all humans, animals and all things in nature have a soul – spirit) with several meanings and with different characters. The difference between soul and spirit is explained in that only human beings had a soul, while spirit was an abstract notion that could be related to a wide spectrum of natural phenomena. The opinion is that animism must have developed from the dream experience, where people generally feel as if they existed independently from their bodies, flying in the other worlds. In short, the soul takes “journeys” outside the body. During such dream journeys they could meet dead relatives, friends, or their spirits (souls). 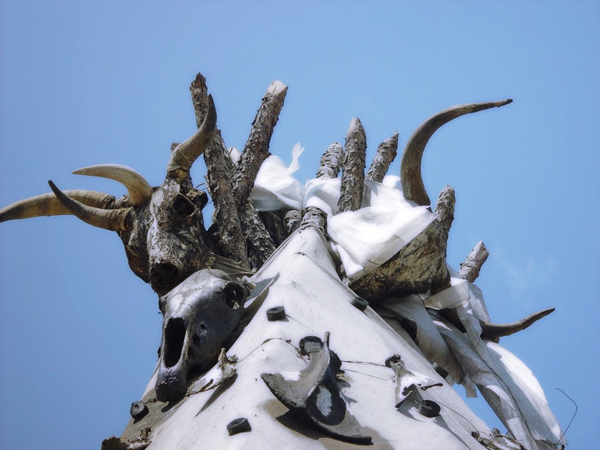 The central element in this is constituted by the worship of the Blue Mighty Eternal Heaven – “Blue Sky” (Köke Tengri, Erketü Tengri and Möngke Tengri). There are a total of 99 Tengris (sky-spirits) or heavenly creatures in the lower and upper world, in which Köke Möngke Tengri (Eternal Blue Heaven) is the supreme. He is the creator of the visible and invisible world. In the Asian mythologies such a monotheistic world is referred to by multiple Gods (Tengris, Burkhans and Lords). The next to Köke Möngke Tengri is the Qurmusata King. He has a special relation with the origin of fire. People said that: “Buddha struck the light and Qurmusata Tengri heated the fire”. The fire is sacred for this people. One of this rules (taboo) says: “Never stamp out the fire or put rubbish or water on it”.